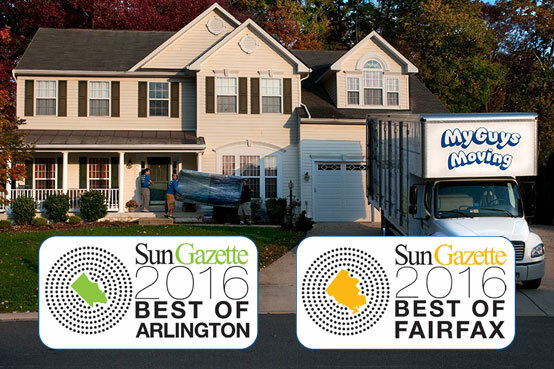 My Guys Moving & Storage was voted the Best Moving Company in Northern Virginia, based on a poll by the Sun Gazette of its readers, residing in over 61,000 households in Arlington, Fairfax, Great Falls, McLean, Oakton, Tysons and Vienna. These readers are discriminating renters and homeowners who have plenty of choices when it comes to selecting the best moving companies. Though this is the first year that My Guys Moving & Storage won the prestigious awards of Best Moving Service in Arlington and Best Moving Service in Fairfax, it has won the past three consecutive years in Loudoun County and Prince William County. The Reader’s Choice Polls are a great way of discovering new places to eat, as well as finding top-rated service providers, ranging from architects to veterinarians. For a complete list of all the winners, and favorite local businesses, people and attractions, check the Sun Gazette newspaper’s website. See Results – Best of Arlington 2016. There will be an event in which My Guys Moving will thank the community for all its support. Check our Facebook page for details as we get closer the date in August. Hope to see all you there! For 2016, thank you all for voting us “Best Moving Service in Arlington” and “Best Moving Service in Fairfax.” We couldn’t have done it without you! And remember… Have Your Guys, Call My Guys!